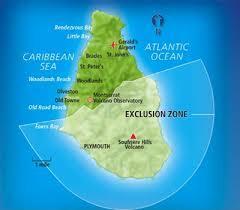 Montserrat is a small British Overseas Territory located in the Leeward Islands of the Caribbean. From Guadaloupe we had a pleasurable 36nm sail around the south end of the island where we could see the desolated area beneath the volcano known as the exclusion zone. 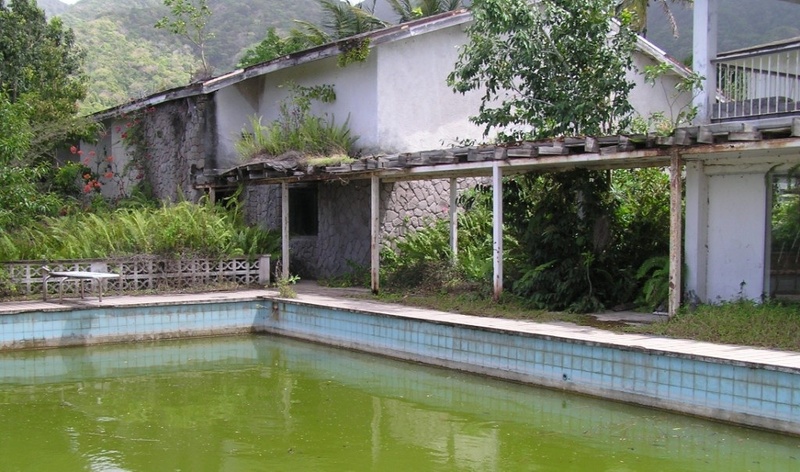 Montserrat is famous for a few things that you may be familiar with – the Soufriere Hills volcano eruptions between 1995 to 2010; plus the famous AIR Studio managed by the late George Martin where many well known celebrities cut a disk or two. Another lesser known, but probably more important fact is the St Patrick’s Day celebrations. St Patrick’s Day at Montserrat was recommended to us. As it’s sometimes difficult to coordinate our sailing life with special island events, this time we would be in the area and decided to pay a visit. From Guadaloupe we sailed around the southern end of Montserrat which offered good views of the damage caused by the various eruptions. The volcano is quiet for now. Little Bay on the north west of the island is the main port where yachts can anchor. The anchorage is often rolly and through good luck rather than good planning we enjoyed easterly winds and north-east swell which minimised the roll. A northerly swell here would be horrific! A concrete wharf at the north of the port is where dinghies can secure to a metal dock. The wharf is often busy with frequent cargo ships and ferries so caution is needed. Customs and Immigration are located at the port. Using the online notification program Sailclear the check in and out was reasonably quick. As we were staying less than 72 hours we could check in/out at the same time. (fee EC$35/A$17). A quick stop at the Port Security to complete another form then we were free to explore. The Tourist Office is no longer at the old Market building. It is now located in a new Social Securities Building high on the hill, but only a ten minute walk from the port. The young lady there was very friendly and gave us the rundown on St Patrick’s Day celebrations. I didn’t realise what a big deal St Patrick’s Day is to Montserratians! Outside the gate was local guide and taxi driver Joe Phillip. His name is synonymous with Montserrat through word of mouth, blogs and Chris Doyle’s sailing guides. Joe runs a 3-4 hour tour around the island and is known for his many photos taken before and after the volcanic eruptions which destroyed much of this island between 1995-2010. There are other tour guides too that offer a similar service. Celebrations for St Patrick’s Day begin on the 10th March and last for around ten days. Various events, such as cricket games, dances, all accompanied by loud ‘soca’ music (a mixture of ‘soul’ and ‘calypso’) take place over the island beginning at 5am with some events starting at 11pm. At the port the music from ashore blared out until and unbelievable 7am! With Joe Phillip as tour guide, we joined another four cruisers to make a carload. Joe took us to the Montserrat Volcano Observatory where we watched an interesting 20 minute video of the volcanic explosions then spent some time driving around through dusty roads where the ash had dropped in the south of the island. Joe has photos taken before the explosions and pointed out where two-storey houses were buried by mud, or where roads used to be. We asked him to take us to George Martin’s Air Studio. The vacated studio, which had greats such as Paul McCartney, Police, Elton John to name a few, is now in ruins. From here Joe drove us to a vacated building that had been left at the time of the eruptions. In the kitchen cooking implements rested on the dusty benches, while in the lounge area, chairs and other items were left to rot. A little further up the road, a nearby hotel had accounts records and old calculator the concierge desk while the hotel rooms still had tattered shower curtains and remains of coat hangars. The swimming pool could’ve used some chlorine! Trembles from the volcano began in 1995 after a 400 year hiatus. The subsequent 15 years a series of explosive eruptions covered most of the southern end of Montserrat with mud and ash. In 1997, 19 locals died as the main town of Plymouth was wiped out by a pyroclastic flow. With no main town, the locals have yet to establish a suitable alternative, although local town Brades has a variety of stores and an ATM. The St Patrick’s Day Pageant and Heritage Feast takes place at Salem which is the most southerly town on the island and takes around 15 minutes by bus. There are a couple of ways to get around the island. Outside the port are taxi drivers waiting to take you anywhere for around US$25 (EC$50) one way. However, there is also a local minibus that comes to the port and takes you to Salem for only US$2 (EC$5). Shops and ATM are quite a walk away from the port so local bus is best. this guy peaked too early! 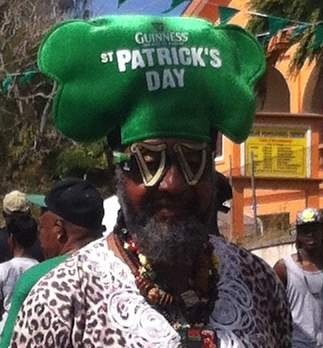 March 17 is a national holiday in Montserrat where enthusiastic locals come out in green to celebrate St Patrick’s Day. Apparently the first European colony was established in 1631 and many Irish Catholics were sent to Montserrat to keep them from fighting against nearby English Protestants on the island of St Kitts. This date also marks the first (unsuccessful) uprising of the blacks against slavery on the same day in 1768. The holiday is certainly a big deal! 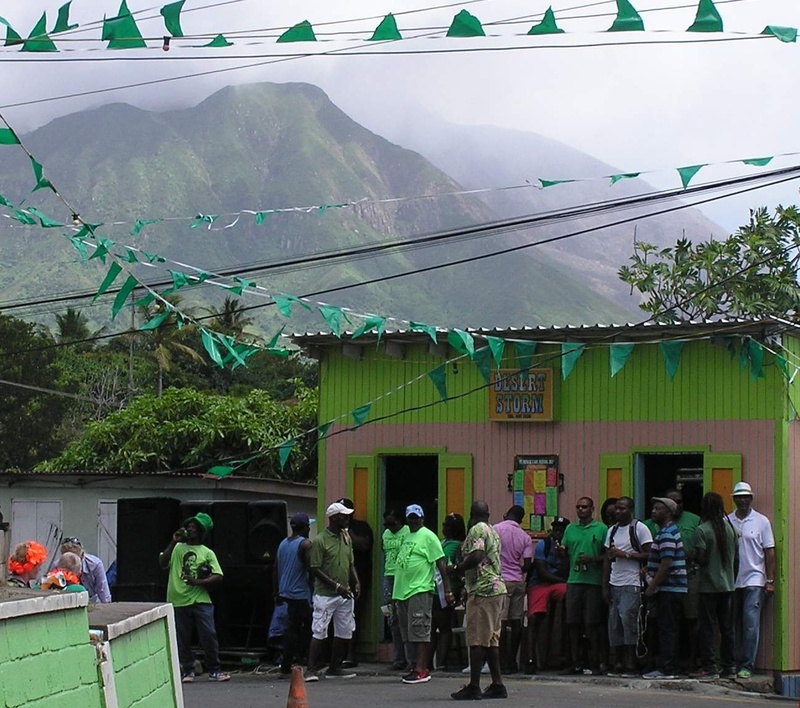 Montserrat’s population is around 5,000 and a huge number of them attended the celebrations dressed up in the island colours of green, orange and white. A variety of T-shirts made me laugh – “Make St Patrick’s Day Great Again” (with a beer swilling Donald Trump image), “This man needs a beer” with arrows pointing upward, and “Irish you were here – St Patrick’s Day Montserrat”. So a few days of fun before heading to the next island. Aside | This entry was posted in 2017, Montserrat and tagged Caribbean, Little Bay, Montserrat, St Patrick's Day, Volcano. Bookmark the permalink.